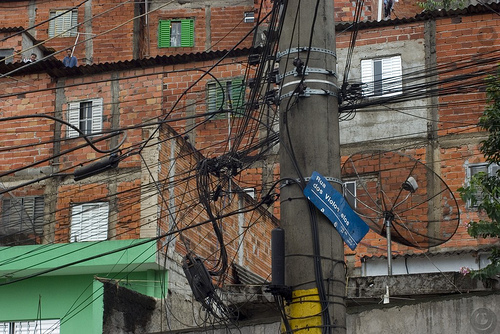 Favelas in Brazil rely on electric grids by Siemens to expand entrepreneurial opportunities. Photo by Daniel Castanho. A recent article in Forbes highlighted the role that multinational companies play in improving quality of life for the lowest-income neighborhoods of developing countries. The rapid growth of cities and the expanding informal housing sections have proven to be a lucrative opportunity for companies like General Electric, Sweden’s ABB, France’s Alstom and Schneider Electric, and finally, Siemens, the German engineering conglomerate. “Mass migrations from rural to urban areas worldwide are creating unparalleled opportunity. Staggering numbers tell the tale: Already 51% of the world’s 6.9 billion people—3.5 billion souls—live in cities; by 2050 demographers think it will be 70%, or 6.2 billion people,” Forbes reports. The article also explains that almost all of this urban growth will be in emerging markets like Asia, Africa and Latin America. Furthermore, according to United Nations estimates, Europe’s share of the world will reduce to 6 percent, whereas Africa’s will increase to 25 percent by 2100. Forbes reports that 70 percent of Siemens’ current sales reside in developed nations. The reduction in share of these markets and the emergence of newer markets in developing nations have encouraged Siemens to target its products to better suit the needs of the latter group. “Already a mighty unit, with 81,000 employees and $24 billion in revenue, [Siemens] will sell electrical equipment, building technology and other products aimed at urban areas.” The effort will be under Siemens’ new division, “Infrastructure & Cities,” and will help the company achieve higher sales. Siemens economists estimate a $2.8 trillion per year market in urban infrastructure, of which $423 billion comes from products that Siemens already sells. In 2011, Siemens estimated to earn revenues of $109 billion. Chief Executive at Siemens, Peter Löscher, aims to reach a new goal of $149 billion in sales. One aspect that threatens the health of these growing cities is traffic. According to Forbes, Siemens commissioned a study surveying 500 city managers, municipal employees and private company executives from around the world to discover that transportation is rated as the highest priority investment in alleviating the stress on growing cities. In addition to identifying the problem, Siemens has also been working to resolve issues of congestion and transportation. In Wuhan, China, Siemens operates automated systems to smooth traffic, Forbes reports. The company also recently won a subway contract in Wuhan, adding public transportation options to the city’s growing mobility needs. Siemens was also involved in building Beijing’s subway lines and the company is adamant on bidding on similar projects in the region. Siemens’s subway ambitions have also spread to São Paulo. The company won the bid for a $200 million project to construct 14 six-car trains, electrical equipment and a computerized control room for the city’s Via Quatro, a driverless electric subway train that can carry 900,000 commuters in one hour. The system is already operating on a three-mile path and will extend to eight miles by 2014, Forbes reports. The article adds that this extension will cut down the commute time to 17 minutes, a significant reduction in time to rush-hour commute by car or bus.